The baby Beans play at being Hoi-Polloi and Mr. Spook. Beanish shows up with new Beanworld Action Effigies of two very thin Beans. The baby Beans want to know who they are. Professor Garbanzo starts telling the tale. It continues the situation at the end of the previous issue. One day Mr. Spook notices that one of the Beans looks different. It appears to have some sort of hat on. It won't come off. Soon after, the bean starts spending time gazing at the Fix-It Shop (even though she didn't know what it was). Then she begins to dream. In the dream, she meets what looks like a large version of herself. It reveals that it is the Fix-It Shop and that she is Professor Garbanzo. They are a team, but something has gone radically wrong this year. The situation might be okay if Professor Garbanzo can find the Four Realities. "They are the Four Realities and they are our destiny." The baby Beans ask her about the next time she discovered the Four Realities. She replies that that's part of another story - "When Mr. Spook Got His Name". That's a story for another day. The origin of the Boom'r Band is a story yet to be told. Beanish uses Gunk'l'dunk to create his Look·See·Shows. "In the past there have been endless seasonal cycles... But this time around something basic went wrong - very wrong. And the Big·Big·Picture will never be the same!" A reader guesses that Mr. Spook is the result of Gran'Ma'Pa receiving Hoi-Polloi Reproductive Propellant. Mr. Marder states that she's vaguely on the right track, but that no one has got it right yet! Heyoka will play a major role in the destiny of the baby Beans. The baby Beans are learning by play-acting. 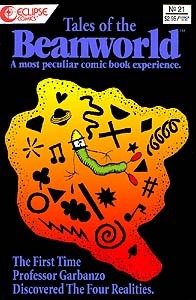 Proffy's story gives us more knowledge of the cyclical nature of the Beanworld. Does anyone know where I can get some Beanworld Action Effigies?